Fighting has raged between rebels and forces loyal to President Bashar al-Assad in Syria's northern Latakia province, a day after 34 people were killed as rebel fighters sought to seize a border crossing into Turkey, an NGO said. The fighting has prompted Assad's government to complain to the United Nations that Turkey was providing cover to rebels crossing the border from its territory. Turkey's armed forces shot down a Syrian plane on Sunday after it crossed into Turkish air space, Turkish broadcaster NTV reported, quoting officials. 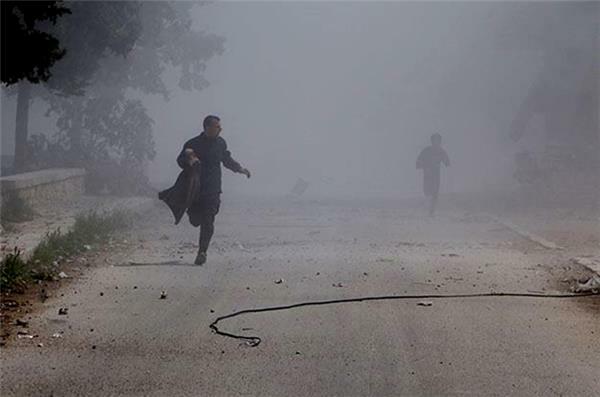 Syrian activists said the incident occurred close to an area where Syrian rebels have been battling President Bashar al-Assad's forces for control of a border crossing between the two countries. Activists and state media say Syrian troops are battling opposition fighters for control of a border post on the Turkish frontier. Rebels have been on the offensive since Friday in the border area of northwestern Latakia province, where they have captured a crossing point into Turkey. The Britain-based Syrian Observatory for Human Rights reported heavy fighting Sunday around Kasab, a town with a large Armenian community near the Turkish border. Syrian state television quoted an unnamed military official as saying that government forces inflicted "heavy losses" among rebels. 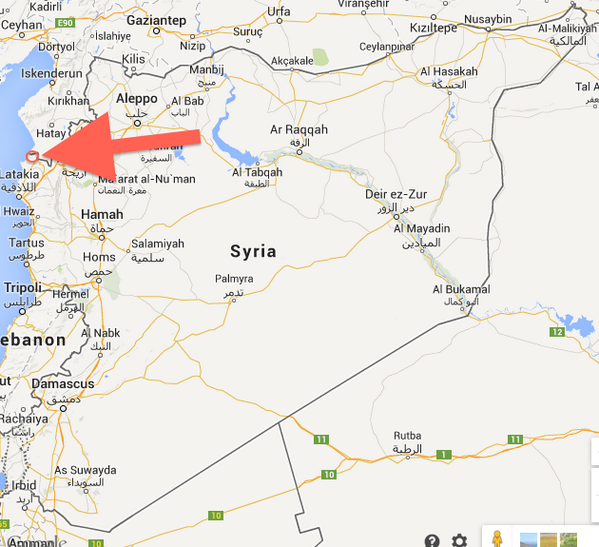 State TV says the rebels entered Syria from Turkey. The Observatory also reported heavy fighting in the contested northern city of Aleppo, which is divided between rebel and government forces. Turkish Prime Minister Recep Tayyip Erdogan congratulated the military for downing a Syrian warplane near the border and warned of a "heavy" response if its airspace was violated. Erdogan said during an election rally, referring to the regime of President Bashar al-Assad. 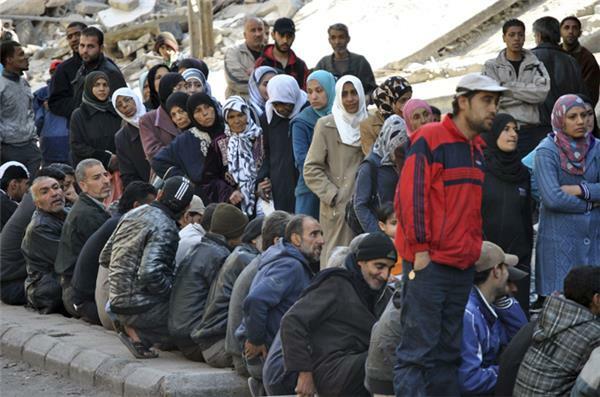 The United Nations accused Syria's government and rebels of hindering aid access, suggesting both sides could be violating UN Security Council demands that emergency relief reach civilians caught in the crossfire of the three-year civil war. A month after the 15-member council achieved rare unity to unanimously approve a resolution demanding rapid, safe and unhindered aid access, including across borders, UN chief Ban Ki-moon said the situation "remains extremely challenging." In Ban's first report to the council on the implementation of the February 22 resolution - obtained by Reuters on Sunday - he said 175,000 people remain besieged by government forces and 45,000 people trapped by opposition groups in several areas. 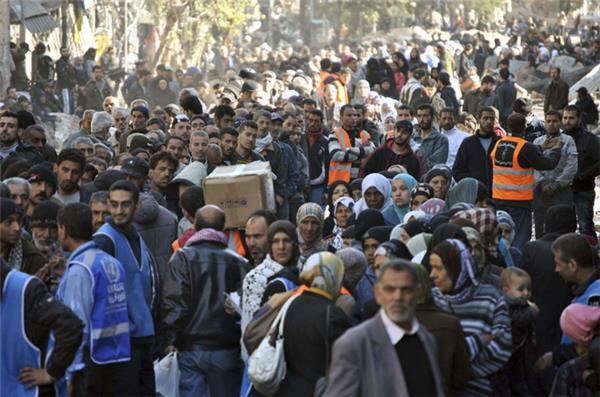 "Humanitarian access in Syria remains extremely challenging for humanitarian organizations," Ban said. "Delivering life-saving items, in particular, medicines, remains difficult. 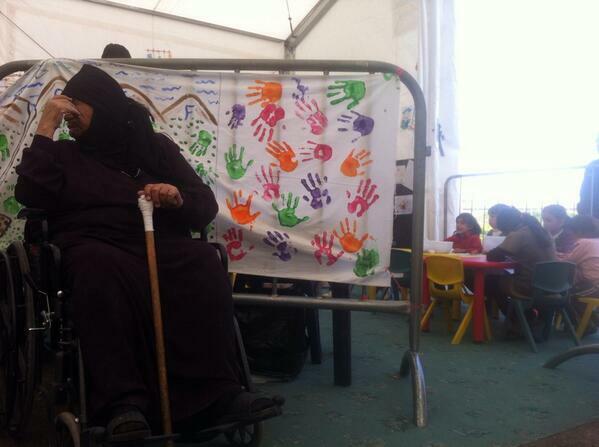 And the assistance reaching people continues to fall far short of what is required to cover even their basic needs." US Secretary of State John Kerry said on he hoped the Crimea situation would not impact cooperation with Russia on international efforts to destroy Syria's chemical weapons. "I hope not. All I can say is I hope the same motivations that drove Russia to be a partner in this effort will still exist," Kerry told reporters in the Hague, where he is planning to attend a G7 summit. Syrian President Bashar al-Assad's government agreed to destroy its chemical weapons arsenal after a chemical attack killed hundreds of people around Damascus last year. 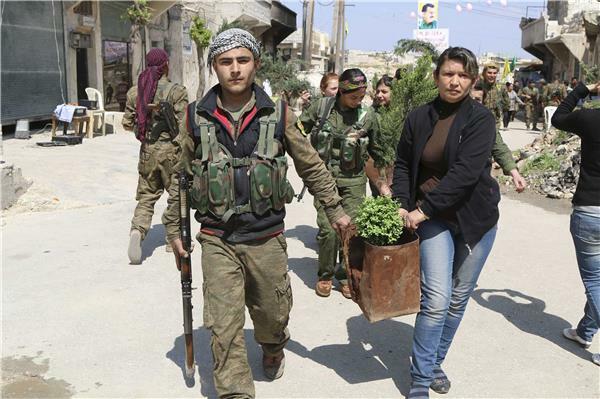 Activists say rebels have captured a small town in northwest Syria near the Turkish border. The Britain-based Syrian Observatory for Human Rights says opposition fighters took Kassab in Latakia province on Sunday. The activist group says fighting is raging Monday outside the town. Rebels have also seized a nearby border crossing to Turkey just outside of Kassab since launching an offensive in Latakia late last week. The mountainous coastal province is a bastion of support for President Bashar al-Assad. In an amateur video posted online, two opposition fighters stand on a rooftop in Kassab and raise their arms in victory. The camera pans past the base of two smashed statues that the narrator says were of Assad's late father, Hafez. United Nations Secretary-General Ban Ki-moon is blaming the Syrian government and opposition for escalating violence and blocking aid to millions in desperate need of help. Ban says that's despite pledges from both sides to comply with a UN resolution demanding immediate access everywhere in the country to deliver aid. As a result of the intensifying "indiscriminate and disproportionate violence and brutality," Ban said, "around 3.5 million people are now estimated to be in need of assistance in hard to reach areas, an increase of one million since the beginning of 2014." 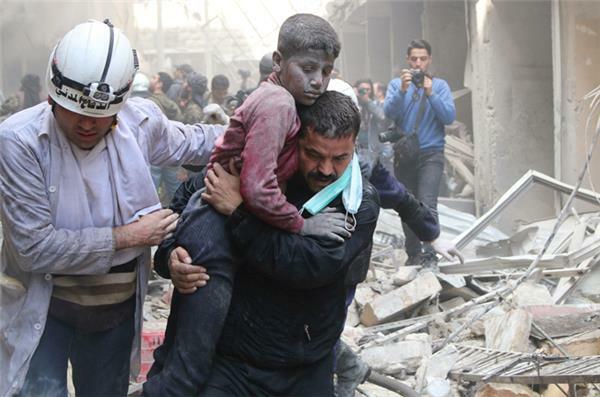 In a report to the Security Council on Monday, Ban strongly condemned the government's heavy shelling and use of barrel bombs in residential neighborhoods and "terror acts" by extremist groups. 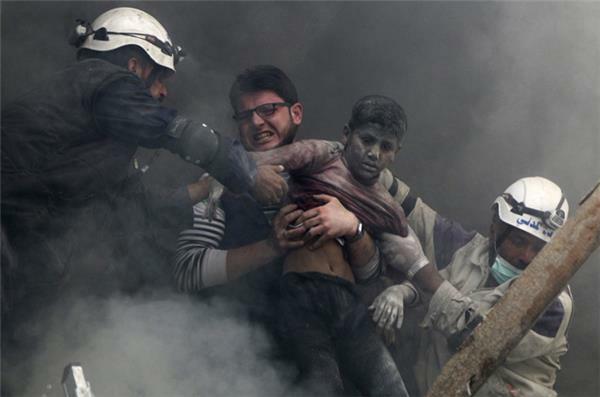 Syrian troops backed by fighter jets are trying to dislodge rebels from a border town in Latakia province. 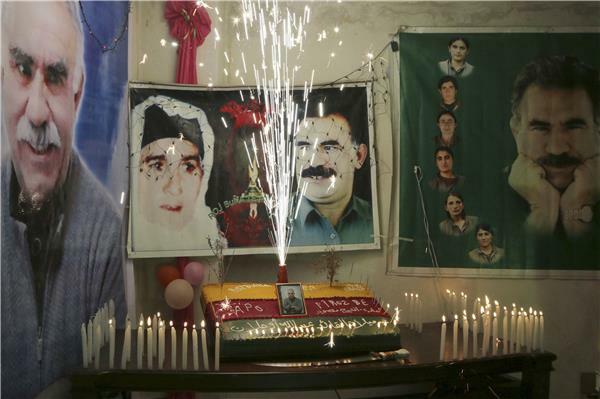 Earlier a cousin of President Bashar al-Assad was killed during the battle for Kasab. In Aleppo rebel forces have also seized a strategic hilltop as they try to fight back against advances by government forces. The head of the Syrian National Coalition, Ahmad al-Jarba, has criticised an Arab League decision barring the opposition from filling his country's seat at the bloc's summit. Addressing the Arab League summit on Tuesday, he said the decision undermines the rebels' position in the three-year Syrian conflict. Al Jazeera's Mohamed Vall reports from Kuwait City. Syrian activists say rebels and government forces are clashing over another coastal town in Latakia province, as opposition fighters slowly press their advance in the area. Wednesday's fighting for the town of Qastal Maaf comes after rebels in recent days seized the Kassab town and border crossing with Turkey, as well as a small strip of the coast nearby _ their first access to the sea since the Syrian conflicted erupted three years ago. An activist in Latakia who only identified himself as Mohammed, fearing for his safety, says rebels hope that seizing Qastal Maaf will draw more Syrian soldiers to the area, relieving some pressure on rebels routed elsewhere. Five people have been injured by a Syrian air strike on the suburbs of the Lebanese border town of Arsal, Al Jazeera's correspondent reported. A suspected bomb-maker died of his wounds after he was shot by Lebanese soldiers trying to arrest him at a house in a border town near Syria, security sources said. Sami Al-Atrash was suspected by authorities of preparing car bombs to plant in Shia areas and coordinating rocket attacks on Shia towns in retaliation for Lebanese Shia group Hezbollah's role in Syria. Sources said Lebanese intelligence services found out that Atrash was at a house in the border town of Arsal and soldiers went to raid the house. 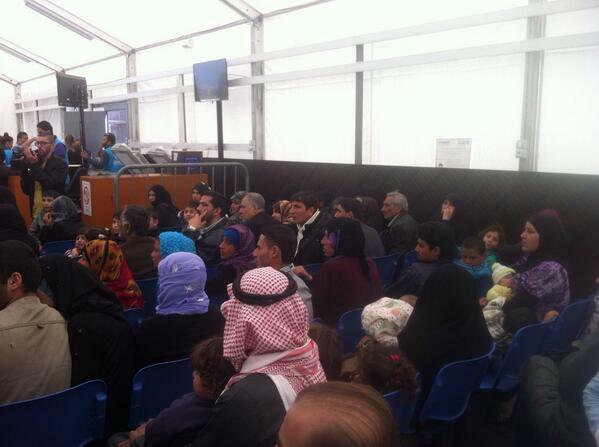 When they arrived, Atrash and two companions opened fire, and the army responded. 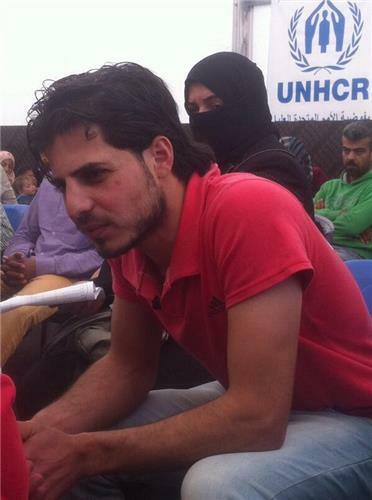 Atrash was wounded and later died in hospital, while his Syrian companion was in a critical condition, the sources said. Turkey banned YouTube on Thursday after the video-sharing website was used to spread damaging leaked audio files from a state security meeting debating possible military action in Syria. The recording purports to be of senior Turkish government, military and spy officials discussing plans to stage an armed clash in Syria or a missile attack that would serve as a pretext for a military response. Prime Minister Recep Tayyip Erdogan, already ensnared in a corruption scandal and hit by recent mass protests ahead of crucial local elections on Sunday, angrily lashed out at his political opponents for leaking the recording. 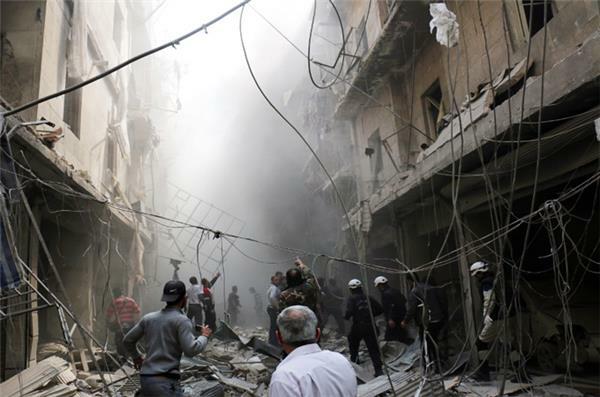 Syrian activists say government fighter jets have targeted rebels on the outskirts of Damascus on Thursday. The video appears to show the warplane circling, before striking its targets. A suicide bomber killed himself and three soldiers when he detonated a car bomb at a Lebanese army checkpoint in the border town of Arsal, a security official said. The Lebanese army said in a statement that four other soldiers were wounded in Saturday's attack on the checkpoint at Aqabet al-Jurd in the Arsal area. To read Al Jazeera's full article click here. Arsal is home to thousands of Syrian refugees but also Syrian rebels and their Lebanese allies who have fled a Syrian army advance on the Syrian side of the border. Vladimir Putin is the world leader who is most admired by the head of Britain's anti-European Union party because of the Russian president's "brilliant" handling of the Syria crisis, Nigel Farage said in an interview published on Monday. When asked which leader he had most esteem for, Farage told the GQ magazine: "As an operator, but not as a human being, I would say Putin." "The way he played the whole Syria thing. Brilliant. Not that I approve of him politically. How many journalists in jail now?" the head of Britain's UK Independence Party (UKIP) was quoted as saying. Putin has kept Syrian President President Bashar al-Assad in power, repeatedly blocked UN attempts to condemn him and supplied arms for the government side in a civil war in which over 100,000 people have died. 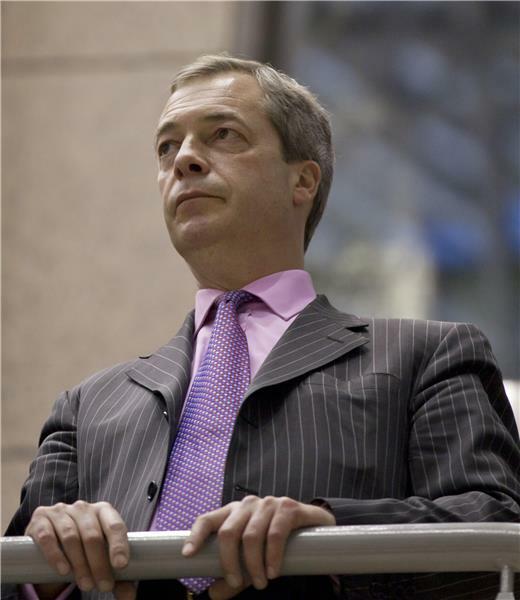 Britain's Deputy Prime Minister Nick Clegg, who last week went head-to-head with Farage in a televised policy debate about Europe, heavily criticised Farage's comments. "I just think it's utterly grotesque that Nigel Farage apparently admires... Vladimir Putin, who has been the chief sponsor and protector of one of the most brutal dictators of the face of the planet, President Assad," Clegg told reporters. German authorities arrested three people with alleged ties to a Syrian radical group Monday in police raids across the country, the federal prosecutor's office said. Two of the suspects, a German and a Turk, are believed to have travelled to Syria last year and joined the militant group Islamic State of Iraq and the Levant (ISIL), which German authorities consider to be a foreign terrorist organisation. The third person, a woman with dual German-Polish citizenship, was taken into custody on suspicion of providing 4,800 euros ($6,600) to the group. More than 100 members of the elite police squad GSG 9, the federal police force and state police conducted simultaneous searches of 10 flats in the capital Berlin and the western cities of Bonn and Frankfurt, including the homes of five more suspects. They are also believed to belong to or support ISIL. Federal prosecutor Harald Range said that the operation showed "that violent conflicts like the one in Syria have a direct impact on us in Germany". "We must decisively fight this phenomenon with all the means of the criminal justice system, with an eye to the possible dangers that radicalised people returning from Syria can pose to the population in Germany," he said in a statement. Syria's information minister has lashed out at Turkey, accusing Ankara of sending foreign fighters across the border to fight Syrian government troops in President Bashar Assad's ancestral homeland in Latakia province. Omran al-Zoubi says neighbouring Turkey is facilitating the entry of "groups of foreigners, armed to their teeth'' into Latakia, where fighting is raging between Syrian government forces and rebels trying to oust Assad. 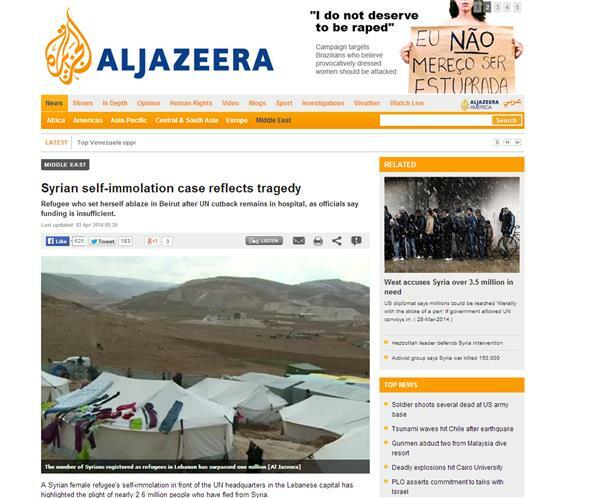 Al-Zoubi spoke to Syrian state TV late on Sunday. Turkey is a NATO member that once had good ties with Syria. 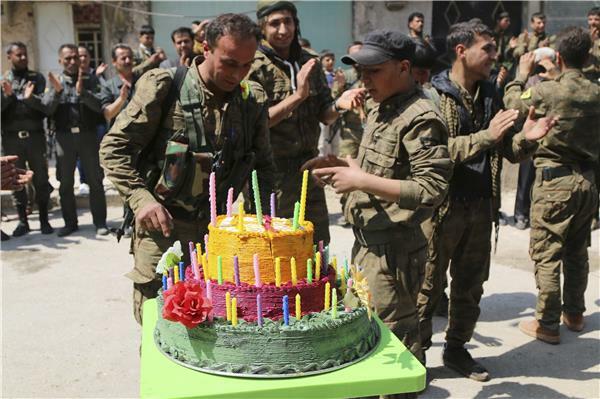 But the two countries had a falling out over Ankara's support for the Syrian opposition in the 3-year-old conflict. Hostilities have flared along the border on several occasions and last week, Turkey shot down a Syrian fighter jet, saying it violated its airspace. The UN refugee agency says the number of Syrian refugees in Lebanon has exceeded 1 million, calling it a "devastating milestone'' for the tiny Arab country with depleted resources and an explosive sectarian mix of its own. Lebanon has become the country with the highest per-capita concentration of refugees worldwide, struggling to cope with a massive crisis that has become an unprecedented challenge for aid agencies. 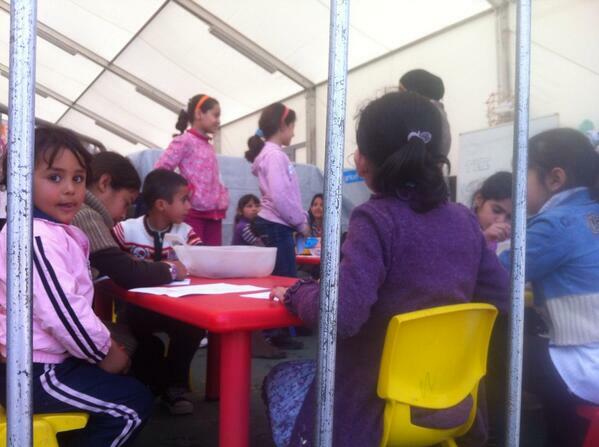 The UNHCR said on Thursday the 1 million Syrians are a huge burden for Lebanon, which has 4.5 million people. A Syrian female refugee's self-immolation in front of the UN headquarters in the Lebanese capital has highlighted the plight of nearly 2.6 million people who have fled from Syria. Mariam al-Khawli, who fled her county with her husband and four children two years ago, set herself on fire last week out of frustration over living without food and cash lifeline after a UN cutback. Assad's forces launched heavy attacks on rebel-held area of Al Mleha in Eastern countryside of Damascus in an attempt to control the main entrances of rebels strongholds in Damascus suburbs. Activists are reporting that government forces supported by national defence fighters have managed to reach the peak of "military observatory 45" in Northern Latakia countryside where clashes are now taking place with opposition fighters including Jabht Nusra. Rebels managed to capture observatory 45 on March 25. Government forces are fighting hard to recapture this strategic point that over looks large areas according to activists. Arsal: A Syrian was killed and 2 others wounded when clashes erupted between them and the army at Arsal's last army checkpoint. The army is on high alert along Lebanon's border with Syria. 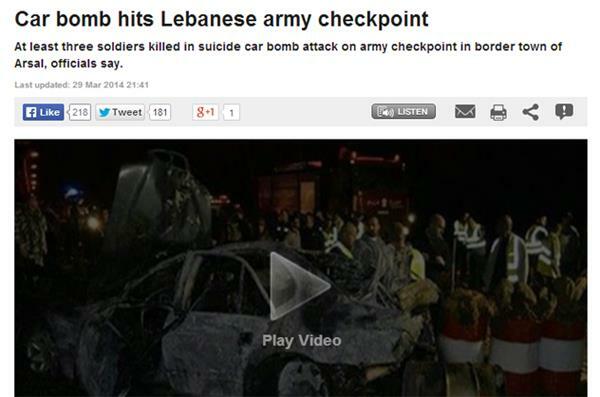 Last Saturday a suicide bomber detonated himself‎ at another army checkpoint, killing 3 soldiers and wounded 4 other. Al Jazeera's Rula Amin, reporting from Tripoli in northern Lebanon, said the cost of the Syrian crisis to Lebanon had been estimated at $.2.5bn in 2013 alone, not just from aid and providing services. Read Al Jazeera's current top story here. 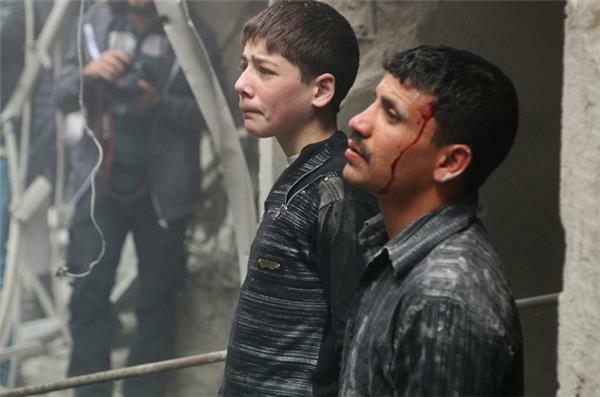 State TV said the deadliest among Thursday's attacks occurred in the suburb of Harasta, where six children were killed and eight were wounded. According to state news agency SANA, five people were wounded when a mortar shell struck the upscale central neighborhood of Maliki. The Britain-based Syrian Observatory for Human Rights said shells also struck central Damascus, including the Umayyad Square, which is close to the TV and radio stations as well as the army command. It said there were no casualties in the square. Activists reported aerial attacks and shelling targeted al-Mleiha in Damascus' eastern suburbs, which resulted in several casualties. فيلق الرحمن || المليحة || اشتباكات عنيفة وصد تقدم ميليشيا النظام بقذيفة آر بي جي. The head of the mission charged with destroying Syria's chemical weapons has told the UN Security Council on Thursday that Syria can still meet the April 27 deadline to remove all chemical agents from the country even though shipments have been halted for two weeks because of worsening security, UN diplomats said. Sigrid Kaag told the council that the Syrian government said it halted the movement of convoys because of worsening security, according to the diplomats, who spoke on condition of anonymity because the briefing was private. But the government informed Kaag's mission on Sunday that it wanted to resume operations "in coming days," they said. UN deputy spokesman Farhan Haq said authorities informed Kaag's mission that the halt of shipments was due to the deteriorating security situation in Latakia province, where the chemicals are put on ships in the port of Latakia. 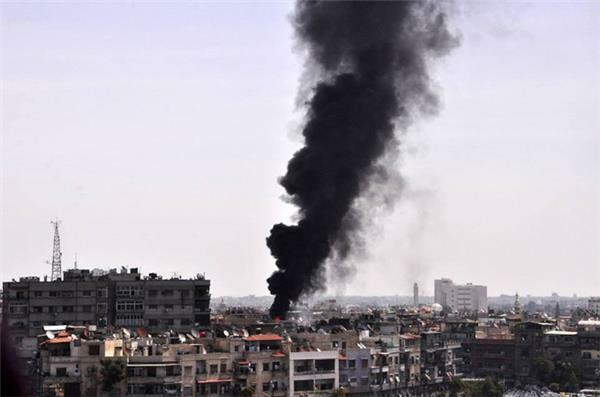 In this photo released by the Syrian official news agency SANA, black smoke rises from the rooftop of a building that was, according to SANA, attacked by a mortar shelled by the Syrian rebels in Damascus, Syria, Saturday, April 5, 2014. 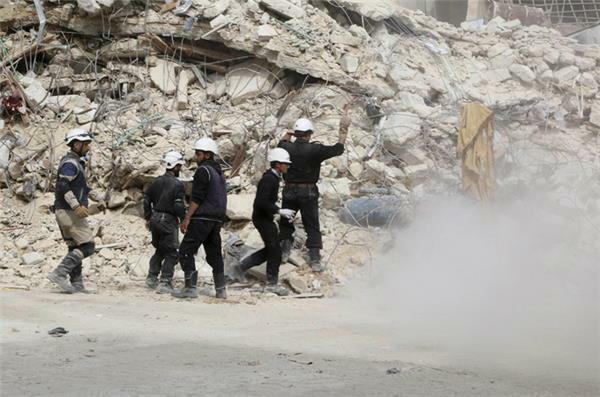 Civil Defence members clear a damaged site after what activists said was an air strike from forces loyal to Syria's President Bashar al-Assad in the Al-Maysar neighbourhood of Aleppo. 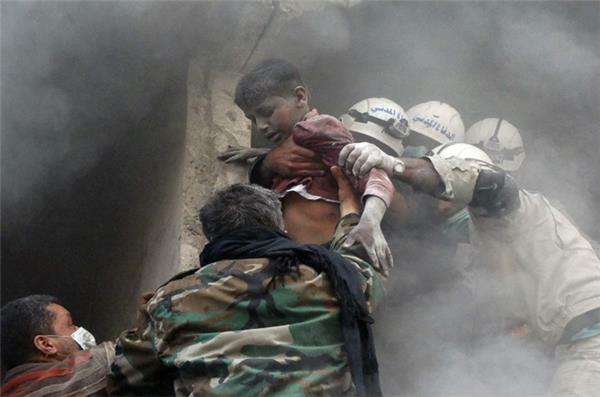 Emergency responders help evacuate a Syrian boy from a residential building reportedly hit by an explosives-filled barrel dropped by a government forces helicopter in the Shaar neighbourhood of the northern Syrian city of Aleppo. The United Nations says it is alarmed at "violent nature" of a demonstration in a massive Syrian refugee camp in Jordan that killed one person and wounded dozens. The UN refugee agency says a "heated demonstration" in Jordan's sprawling Zaatari refugee camp Saturday turned to "a violent one" after hundreds, possibly thousands of refugees started throwing rocks at a police post. The agency said Sunday that the protest started over a refugee family being held there after police detained them and a driver who tried to smuggle them out of the camp. 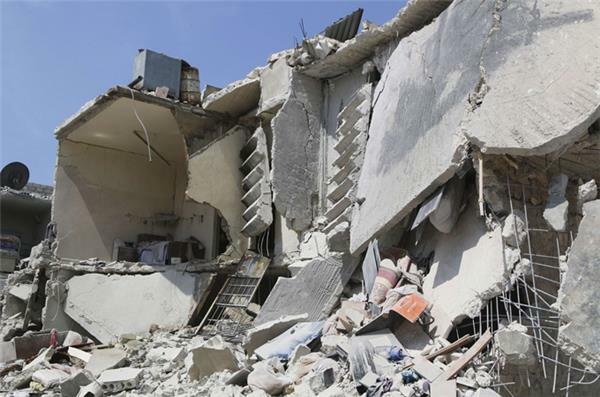 The aftermath of what activists said where explosive barrels dropped by forces loyal to Syria's President Bashar Al-Assad in the Al-Shaar neighbourhood of Aleppo. 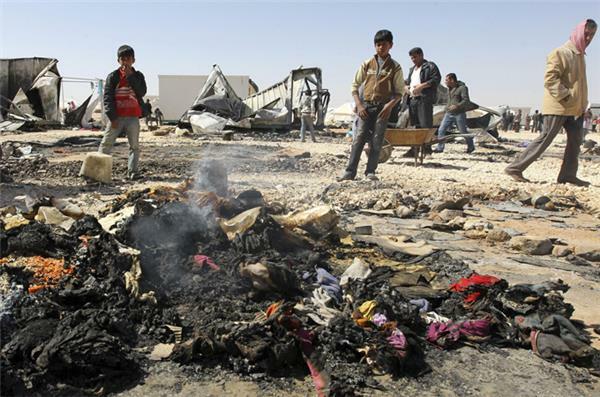 Syrian refugee children look at the remains their burnt belongings, a result of a clash between security forces and Syrian refugees at the Al-Zaatri refugee camp in the Jordanian city of Mafraq, near the border with Syria.